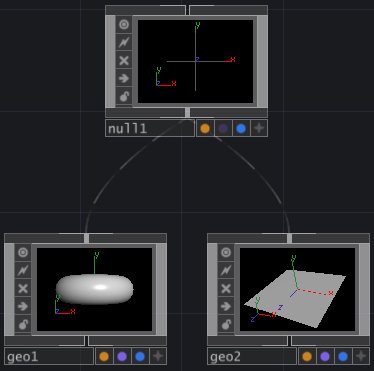 The Object Component types (Geometry, Camera, Light, Null...) can be placed in a 3D "hierarchy" using the top and bottom connectors of the nodes in a network. The 3D hierarchy affects what you see in the Render TOP and in any of the 3D component type viewers. Below geo1 and geo2 are both a "child" of null1. When you connect one Component to another via their top and bottom connectors, you create a "parenting" or "hierarchical" relationship. Moving a parent through its Transform page will move its children with it. Each Component can have only one parent. Parenting is also done by putting an Object COMP type inside another Object COMP. This is the same as if you had wired them using the top/bottom connectors. If a COMP is wired to another COMP through it's top connector, than that COMP is it's transform parent. If it isn't wired to anything through it's top connector, the the COMP it is located within is it's transform parent. If, for example, you wanted to include as part of your scene the perspective on the world as seen from a particular Component, you could link the output of a Geometry Component to the input of a Camera Component. Defining a parenting relationship in this way means that any transformations you make to the geometry will include the camera as well.